Competing at Richmond’s newest long course facility, Bill Winters punched his ticket to Omaha for the 2012 Olympic Trials with a phenomenal time of 2:19.88 in the 200 breaststroke, dipping just below the 2:20.79 qualifying time. 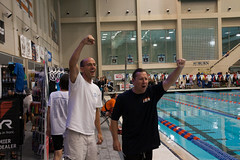 The time breaks the current USMS record of 2:27.79 for men 45-49, established by David Guthrie in August 2008, and also clears the World Record time of 2:24.91 set by Ukraine’s Volodymry Pylypchenko in September 2009. Winters, a mere three weeks shy of his 45th birthday, becomes the oldest male qualifier in the history of the sport. Originally from Austin, Texas, Winters was an NCAA qualifier at Auburn University, graduating in 1990. 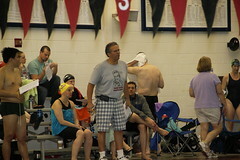 Formerly a sprint freestyler and individual medley specialist, Winters reports that he was very close to a Trials cut in the 200 IM in 1988, but this marks his first-ever Trials cut. He plans to attend the Trials, scheduled for June 25-July 2, provided his boss and his parole officer grant his request for leave. 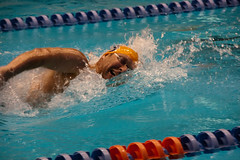 Competing at the Poseidon Classic in Richmond, Winters won the 200 breast from lane 10 during finals on Saturday night. In the process, he also becomes the first person to achieve an Olympic Trials cut in the new natatorium. The 10-lane Myrtha pool, originally used for the 2008 Olympic Trials at the Quest Center in Omaha, had been sitting in boxes on a shelf at a Nebraska WalMart for years. The Collegiate School Aquatics Center opened last month and is jointly owned by five groups: Poseidon Swimming, Collegiate School, Trinity High School, the Richmond Kickers, and the Richmond Sports Backers. Although a kink in the new timing system appears to have lost his first split, a spokesperson for USA Swimming confirmed that the pool length was measured and certified at fifty meters, plus or minus a few yards. According to the HyTek results, he was out in a blazing 1:04.48, and brought it back in 1:15.40. Amazingly, Winters dropped a staggering 33 seconds from his prelim time of 2:53.50. Coach Mark Kutz: "What the heck was that?" Hey, you had me there for a minute. That’s how much faith I have in Bill’s ability. But it was only for about a minute, give or take 50 seconds. Another great April Fool’s article. Thanks. This is no surprise. The early start, equipment assist and long taper are all extremely evident to those of us who swim with Mr. Winters in practice. Bill deserves the result he got. Great reporting from Mr. Dung (aka sen~or BS). As Bill’s older sister, I can attest to his swimming excellence. This article gave me quite a giggle! I knew something was fishy here……as Poseidon is swimming at my school pool.. But it was fun to read. I wish that it was the truth…… what fun it would be! Yea, but his quotes are dead on!!! !